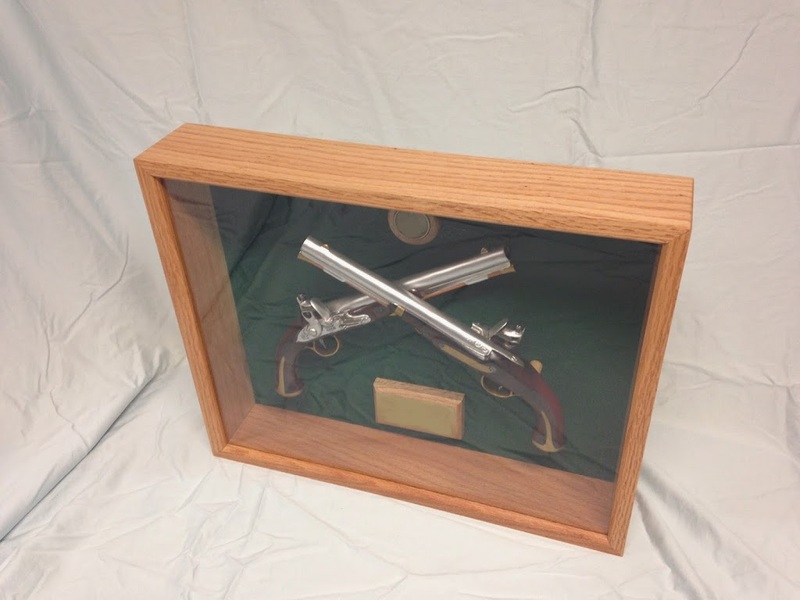 So my latest project which I completed this morning is a display case for some replica Harpers Ferry Pistols. This display case is intended as a going away gift for Military Police Soldiers who leave the section where I work (my day job). Crossed Harpers Ferry Pistols are the insignia for the US Army Military Police Corps. It would be pretty cool if we could present a real Harpers Ferry Pistol but that was a little out of all of our price range. We were able to find a company that made replica pistol kits and made that the center piece of the gift. We wanted the gift to be symbolic of both the unit assigned and our duty as Military Police. It was with that in mind that I designed and built these display cases. The case is red oak that was purchased from a local family owned saw mill. The replica pistols are mounted on the back which is covered in green felt. Above the pistols is a unit coin that is affixed to a wood disc made from the same red oak. Below the pistols are where I mounted a small brass plague which I had engraved the name of the Soldier being presented and the dates that he served. Like I said the red oak was purchased from a local saw mill. I try to purchase as much lumber as possible from local sources. The only down side is that my only local options are red oak, poplar, and if I’m lucky some maple (and that’s only been once). I then cut down the material to a little bit larger than the finished dimension. I always try to allow to give myself just a little wiggle room for a mistake I’m sure to make. 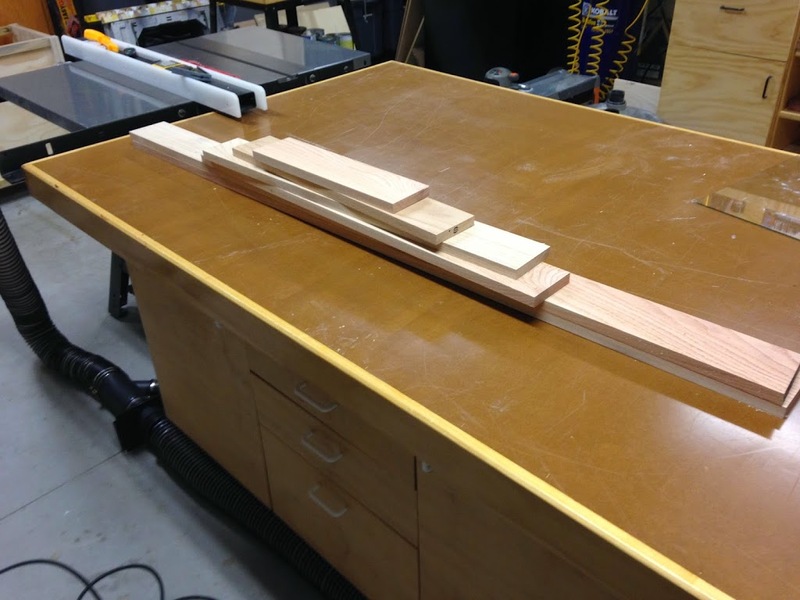 They keep telling me to measure twice and then cut once… or something along those lines. So sometimes I keep cutting… don’t judge me! Well then it on to cutting some miters with my table saw. 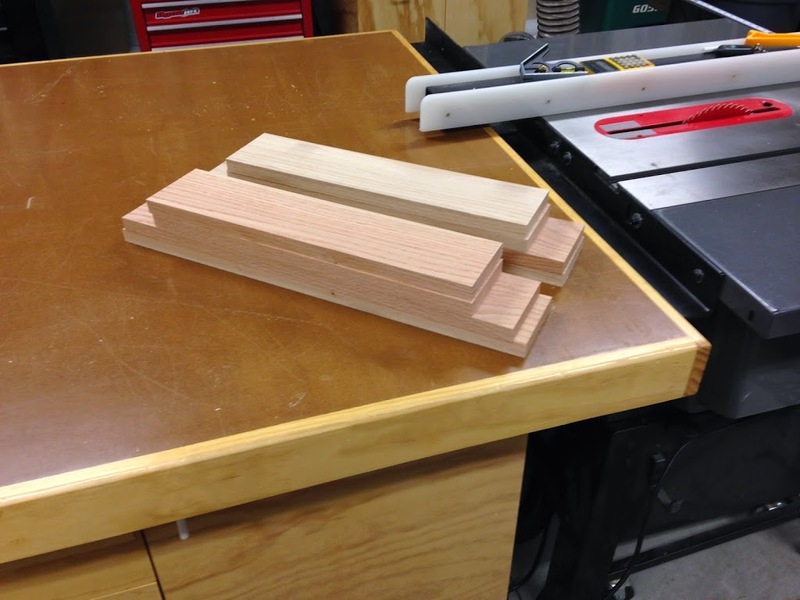 I’ve never really gotten good results cutting miters on my miter saw. My miter saw is dead on at 90 degrees but if you ask it to do anything else it laughs at you and then ruins your project. I then cut a dado to fit the glass front and a rabbit in the back to fit the back piece. Before I glue it all together to make a box I do a little prefinishing. This will prevent a million issues versus waiting to do all your finishing at the end. 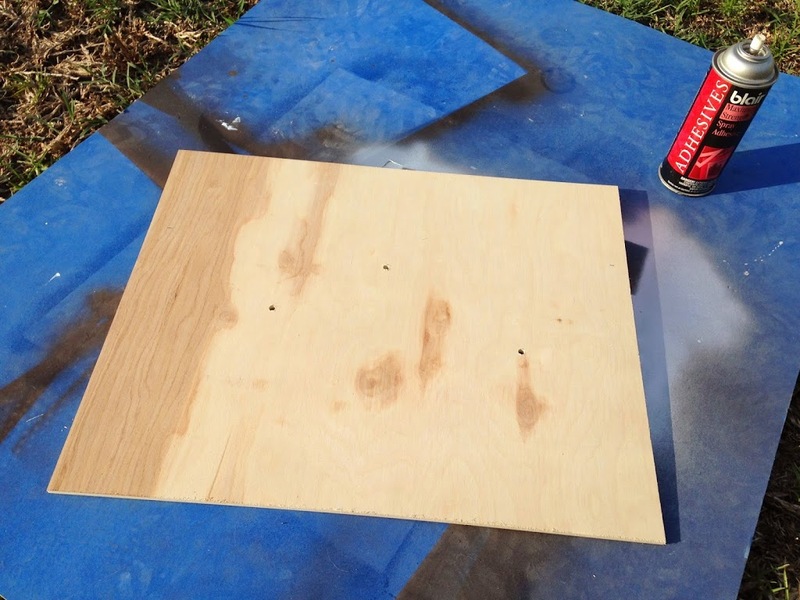 Just use some painters tape to cover any areas that you will glue. The back of the case is quarter inch baltic birch plywood. The company where I purchased the pistol replicas gave the dimensions for mounting the pistols and I made a template to make it easier for the next one I build. Once the back piece was cut and the holes drilled it was time for a little spray adhesive and some green felt. 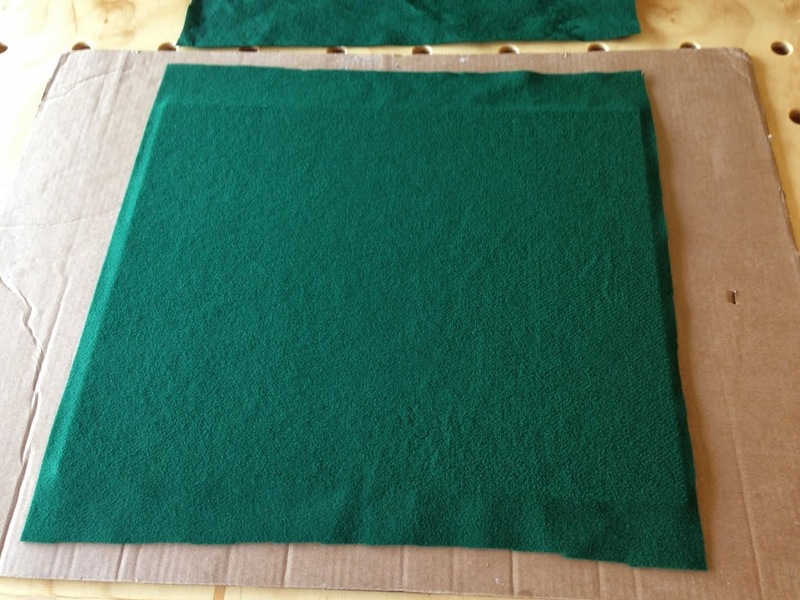 I always over cut my felt on projects like this and then trim it down. This help stretch the felt and insures you don’t end up with something to small to cover the area needed. 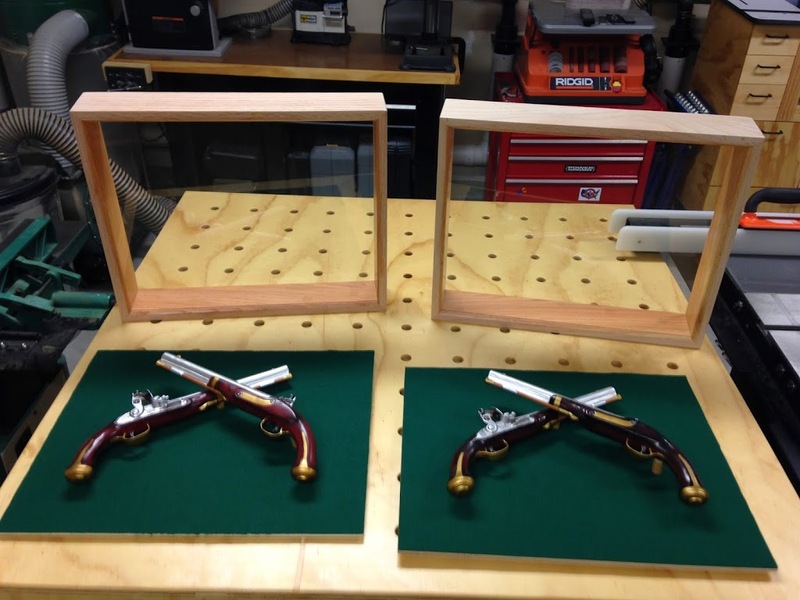 Then it’s time to mount the pistols and start finishing the exterior of the box. 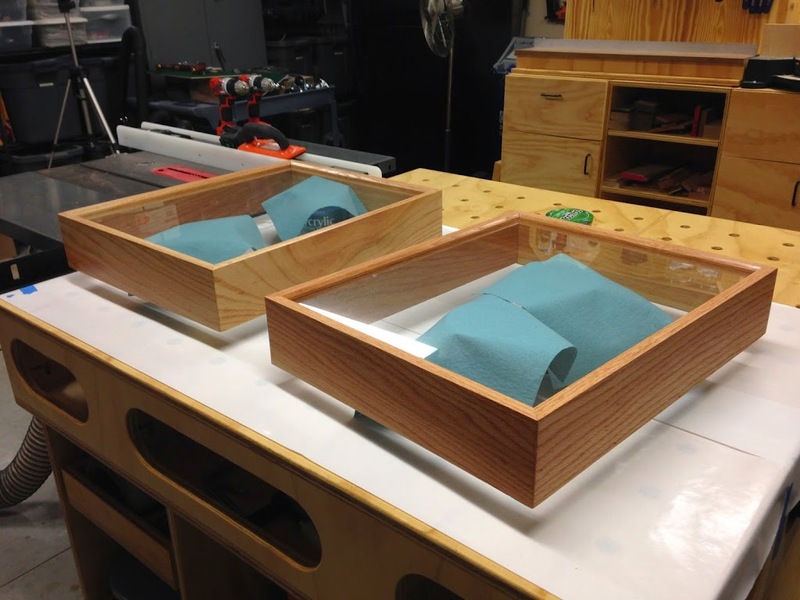 I used a wiping polyurethane to finish these boxes. I took some poly and then cut it by 50% with some paint thinner. This allows it to wiped on and dry a little faster. The only down side is that it takes twice as many coats. But for a smooth finish I think its worth it. From there it was just mounting the coin and plaque and then putting it all together. Hopefully the recipients will enjoy these for many years to come. Please feel free to also stop by my Facebook, Twitter, or here on Google+. I welcome all questions and comments. Thanks for stopping by and I hope to hear from you soon. Thanks April… I dream of owning a miter saw that cuts the angle I want. But I wonder if such a mythical thing exists.